Interested in the latest from Trusted CI? Want a chance to chat in person with us? Members of Trusted CI will be participating in a number of upcoming events over the next few months. EDUCAUSE Security Professional Conference 2018 (April 10-12) in Baltimore, MD. EDUCAUSE brings higher education security professionals together to network and discuss current trends in the industry. Trusted CI's Mark Krenz and Warren Raquel are presenting training sessions on Incident Response and Security Log Analysis. Also, Trusted CI's Von Welch and Jim Basney are co-presenting with IU CACR's Anurag Shankar on Cybersecurity for Research on Campus. 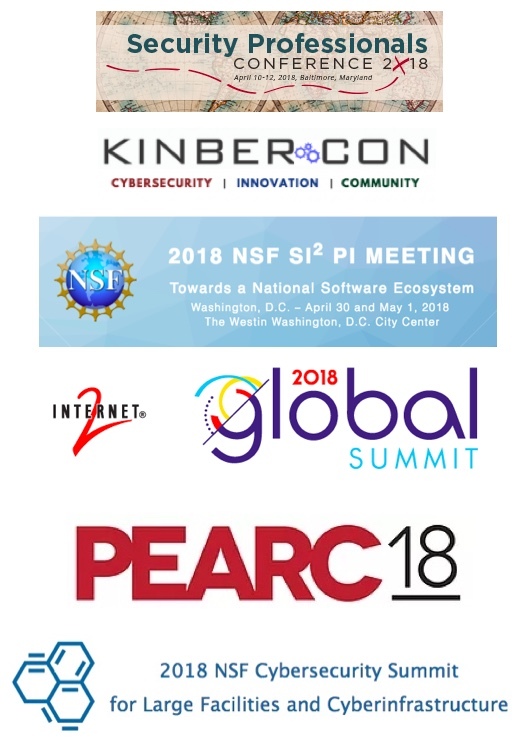 KINBERCON (April 23-25) in Harrisburg-Hershey, PA. KINBERCON's focus is on next generation networks and technology, and brings together leaders in education, healthcare, libraries, and government. The format of KINBERCON includes panels and technical workshops. There are many opportunities for collaborative discussions with speakers and attendees. Trusted CI's Von Welch will be presenting on the project and the intersection of campus IT, info sec, and research. The 2018 NSF SI2 PI Meeting (April 30-May 1) in Washington, D.C. The SI2 PI workshop brings together PIs to present their projects to fellow PIs through posters, lightening talks, and brief presentations. Trusted CI's Von Welch is presenting "Software Security: Selecting engineering and security practices to enable robust CI and trustworthy science." Internet2 Global Summit (May 6-9) in San Diego, CA. The summit focuses on advanced and trusted infrastructure, identity, federation and access management, and solutions for researchers with the goal of benefiting the entire research and education ecosystem. Trusted CI's Jim Basney will be co-presenting CACR's Anurag Shankar on "Cybersecurity for Research on Campus: Not Just HIPAA & FISMA." PEARC 18 (July 22-26) in Pittsburgh, PA. PEARC is an all-inclusive event for scientists, engineers, scholars, artists, and educators who depend on efficient, secure, and reliable digital infrastructure. This year's theme is seamless creativity. Presentation abstracts are still under review. Trusted CI intends to attend and present at this year's conference and will update the community as more information is available. The 2018 NSF Cybersecurity Summit for Large Facilities and Cyberinfrastructure (August 21- 23) in Alexandria, VA. The Summit is hosted by Trusted CI and welcomes cybersecurity practitioners, technical leaders, and risk owners from within the NSF Large Facilities and CI Community, as well as key stakeholders and thought leaders from the broader scientific and information security communities. The Summit includes training sessions, plenary session, and opportunities to network and socialize with peers. Be on the lookout for our call for proposals. Whether you are an operational security pro, high speed networking researcher, NSF PI, or identity management specialist; the coming months present some interesting opportunities to network and collaborate. We look forward to seeing you at these events.